Clarksville, TN – John McDonald and Tom Thayer have brought together the perfect cast for their production of “Spring Awakening”. The result is a powerful, passionate performance that draws the audience in and sends them on an emotional journey with the characters they are portraying. 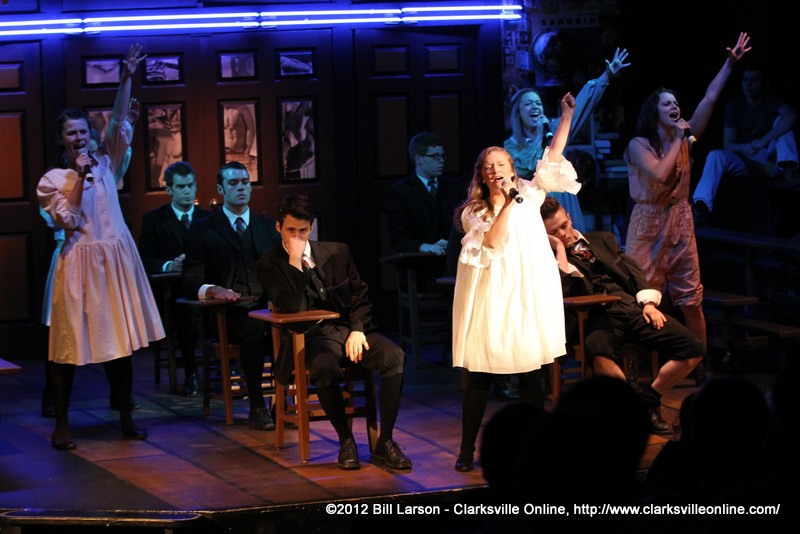 There are only three shows (Thursday, Friday, Saturday) remaining for “Spring Awakening” at the Roxy Regional Theatre. This is one show you do not want to miss. Get to the theatre early, as the last shows will most certainly sell out. “Spring Awakening” is set in a 19th century German village that is socially and sexually repressed. The musical follows a group of teenagers through their own self discoveries as they become young adults. Matt DuMont (as Melchior), Hannah Church (as Wendla) and Gregory Pember* (as Moritz) put on a strong, emotional performance that really lets the audiance feel what their characters are going through. The rest of the cast, Melanie Beck, Josh Bernaski, Ryan Bowie, Regan Featherstone, Humberto Figueroa, Leslie Greene, Erin Keas, Ashley Laverty, John McDonald, Hollie Morse, Sean Ormond, Rob Rodems, Cassie Thompson and Kendall Anne Thompson are equally impressive. During some of the rock-infused musical numbers, the vocals and raw passion of the performers pours off the stage and engulfs the audience in the emotions of the moment. With book and lyrics by Steven Sater and music by Duncan Sheik (known for his 1996 radio hit “Barely Breathing”), “Spring Awakening” is directed and choreographed by Tom Thayer and features Thayer on piano, alongside Vicki King and Wayne Wyman on strings, Bruce Ervin on bass, Thad Wallus on drums and Jarrod Jackson on guitar. This production contains strong language, sexual situations and subject matter not appropriate for all audiences. “Spring Awakening” finishes its run at the Roxy May 3rd through May 5th, playing Thursday night at 7:00pm and Friday and Saturday night at 8:00pm. All tickets are $20.00 and may be purchased online at www.roxyregionaltheatre.org, by phone at 931.645.7699, or at the theatre during regular box office hours (9:00am to 2:00pm, Monday through Friday). *Gregory Pember is appearing courtesy of Actors’ Equity Association, the Union of Professional Actors and Stage Managers in the United States.